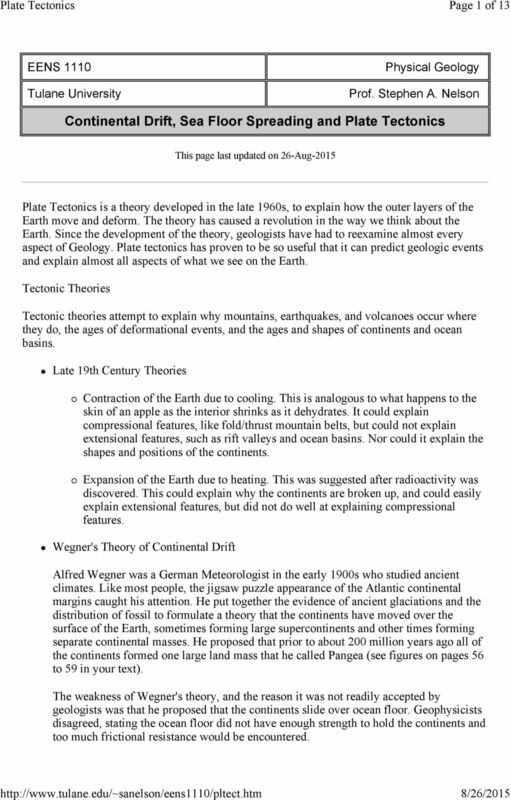 Download "Continental Drift, Sea Floor Spreading and Plate Tectonics"
1 Page 1 of 13 EENS 1110 Tulane University Physical Geology Prof. Stephen A. Nelson Continental Drift, Sea Floor Spreading and Plate Tectonics This page last updated on 26-Aug-2015 Plate Tectonics is a theory developed in the late 1960s, to explain how the outer layers of the Earth move and deform. The theory has caused a revolution in the way we think about the Earth. Since the development of the theory, geologists have had to reexamine almost every aspect of Geology. Plate tectonics has proven to be so useful that it can predict geologic events and explain almost all aspects of what we see on the Earth. Tectonic Theories Tectonic theories attempt to explain why mountains, earthquakes, and volcanoes occur where they do, the ages of deformational events, and the ages and shapes of continents and ocean basins. Late 19th Century Theories Contraction of the Earth due to cooling. This is analogous to what happens to the skin of an apple as the interior shrinks as it dehydrates. It could explain compressional features, like fold/thrust mountain belts, but could not explain extensional features, such as rift valleys and ocean basins. Nor could it explain the shapes and positions of the continents. Expansion of the Earth due to heating. This was suggested after radioactivity was discovered. This could explain why the continents are broken up, and could easily explain extensional features, but did not do well at explaining compressional features. Wegner's Theory of Continental Drift Alfred Wegner was a German Meteorologist in the early 1900s who studied ancient climates. Like most people, the jigsaw puzzle appearance of the Atlantic continental margins caught his attention. He put together the evidence of ancient glaciations and the distribution of fossil to formulate a theory that the continents have moved over the surface of the Earth, sometimes forming large supercontinents and other times forming separate continental masses. He proposed that prior to about 200 million years ago all of the continents formed one large land mass that he called Pangea (see figures on pages 56 to 59 in your text). 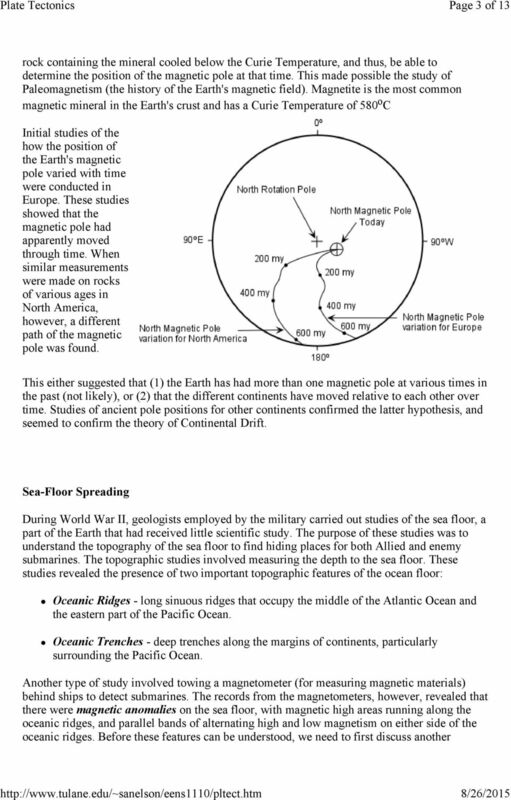 The weakness of Wegner's theory, and the reason it was not readily accepted by geologists was that he proposed that the continents slide over ocean floor. Geophysicists disagreed, stating the ocean floor did not have enough strength to hold the continents and too much frictional resistance would be encountered. 5 Page 5 of 13 fractures it produces earthquakes that get progressively deeper. Plate Tectonics By combining the sea floor spreading theory with continental drift and information on global seismicity, the new theory of Plate Tectonics became a coherent theory to explain crustal movements. Plates are composed of lithosphere, about 100 km thick, that "float" on the ductile asthenosphere. While the continents do indeed appear to drift, they do so only because they are part of larger plates that float and move horizontally on the upper mantle asthenosphere. The plates behave as rigid bodies with some ability to flex, but deformation occurs mainly along the boundaries between plates. 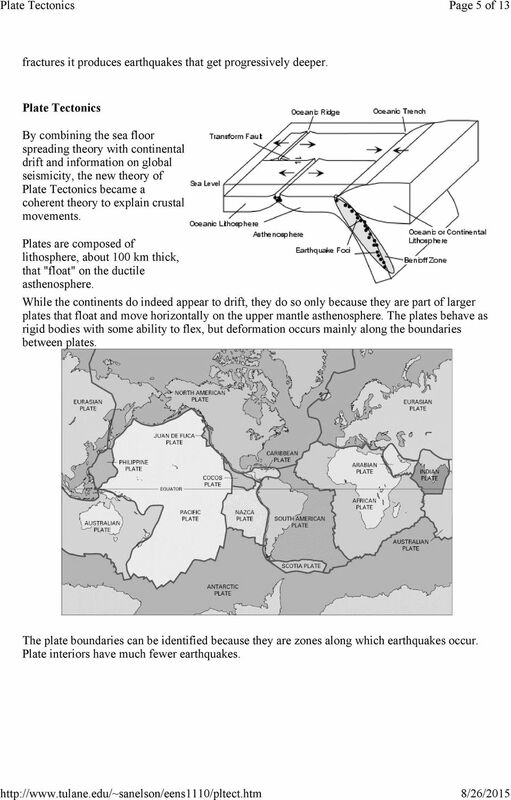 The plate boundaries can be identified because they are zones along which earthquakes occur. Plate interiors have much fewer earthquakes. 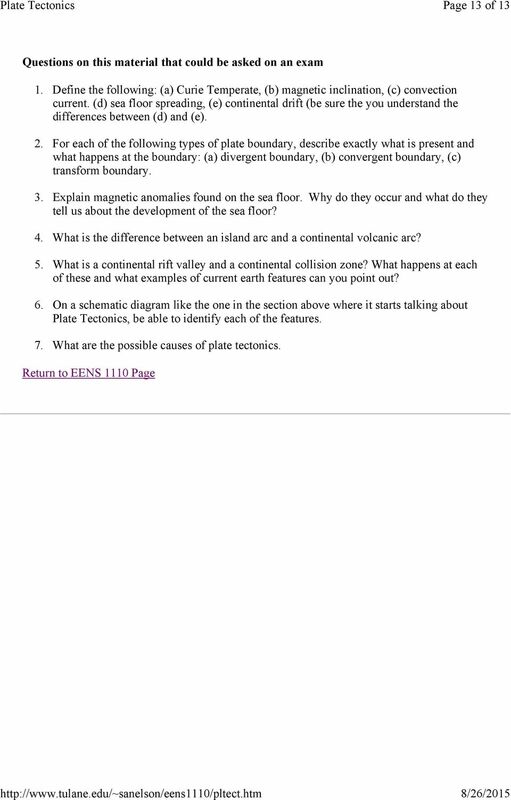 6 Page 6 of 13 Types of Plate Boundaries There are three types of plate boundaries: 1. Divergent Plate boundaries, where plates move away from each other. 2. 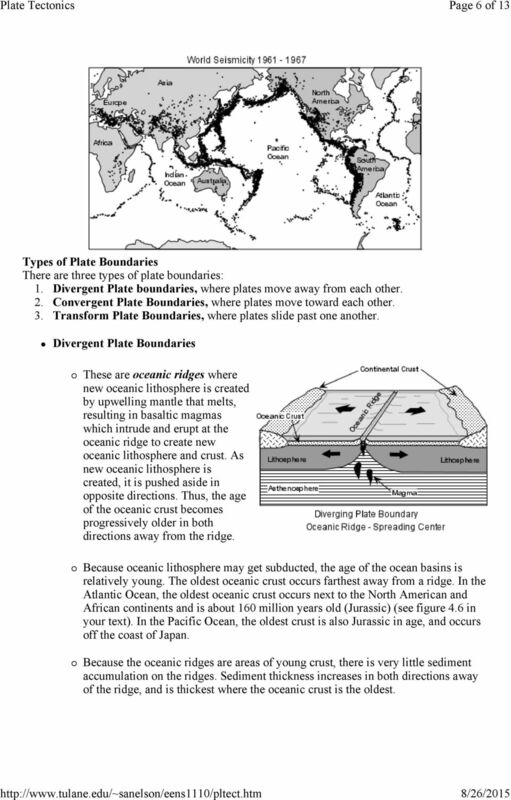 Convergent Plate Boundaries, where plates move toward each other. 3. Transform Plate Boundaries, where plates slide past one another. Divergent Plate Boundaries These are oceanic ridges where new oceanic lithosphere is created by upwelling mantle that melts, resulting in basaltic magmas which intrude and erupt at the oceanic ridge to create new oceanic lithosphere and crust. As new oceanic lithosphere is created, it is pushed aside in opposite directions. Thus, the age of the oceanic crust becomes progressively older in both directions away from the ridge. Because oceanic lithosphere may get subducted, the age of the ocean basins is relatively young. The oldest oceanic crust occurs farthest away from a ridge. In the Atlantic Ocean, the oldest oceanic crust occurs next to the North American and African continents and is about 160 million years old (Jurassic) (see figure 4.6 in your text). In the Pacific Ocean, the oldest crust is also Jurassic in age, and occurs off the coast of Japan. Because the oceanic ridges are areas of young crust, there is very little sediment accumulation on the ridges. Sediment thickness increases in both directions away of the ridge, and is thickest where the oceanic crust is the oldest. 8 Page 8 of 13 earthquakes may extend down to depths of 700 km before the subducting plate heats up and loses its ability to deform in a brittle fashion. As the oceanic plate subducts, it begins to heat up causing the release water of water into the overlying mantle asthenosphere. The water reduces the melting temperature and results in the production of magmas. These magmas rise to the surface and create a volcanic arc parallel to the trench. 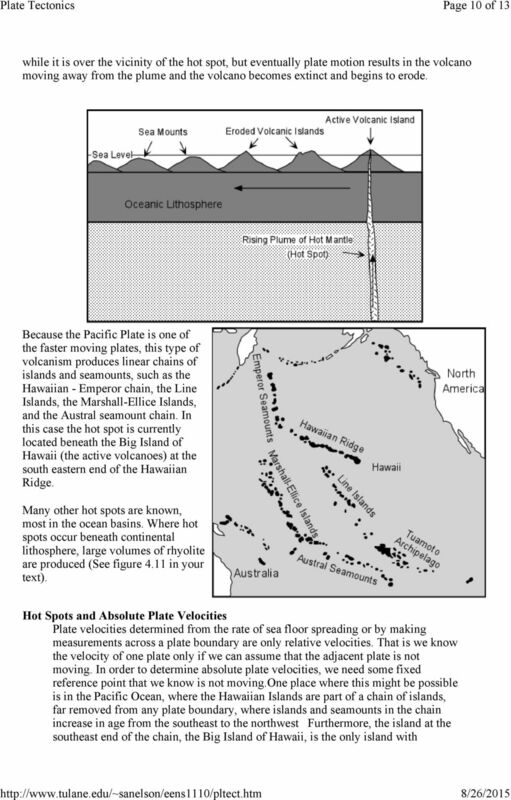 If the subduction occurs beneath oceanic lithosphere, an island arc is produced at the surface (such as the Japanese islands, the Aleutian Islands, the Philippine islands, or the Caribbean islands If the subduction occurs beneath continental crust, a continental volcanic arc is produced (such as the Cascades of the western U.S., or the Andes mountains of the South America) If one of the plates has continental lithosphere on its margin, the oceanic plate will subduct because oceanic lithosphere has a higher density than continental lithosphere. Sediment deposited along the convergent margin, and particularly that in the trench will be deformed by thrust faulting. This will break the rocks up into a chaotic mixture of broken, jumbled, and thrust faulted rock know as an accretionary prism. 11 Page 11 of 13 currently active volcanoes. The island chain appears to have formed as the Pacific plate moved over a Hot Spot, an area in the Earth's mantle where hot material from the Earth's interior is moving upward. If we can assume that such a hot spot is stationary, then we can calculate the absolute velocity of the Pacific Plate as it has moved over the hot spot. By using hot spots and, more recently, the Global Positioning System (GPS), to determine absolute velocities, we find that the African Plate is almost stationary (expected because the African Plate is surrounded by oceanic ridges, and the Mid- Atlantic Ridge is moving toward the west. Furthermore, the Atlantic Ocean is getting bigger and the Pacific Ocean is getting smaller. Evolving Plate Boundaries Plate boundaries can evolve. 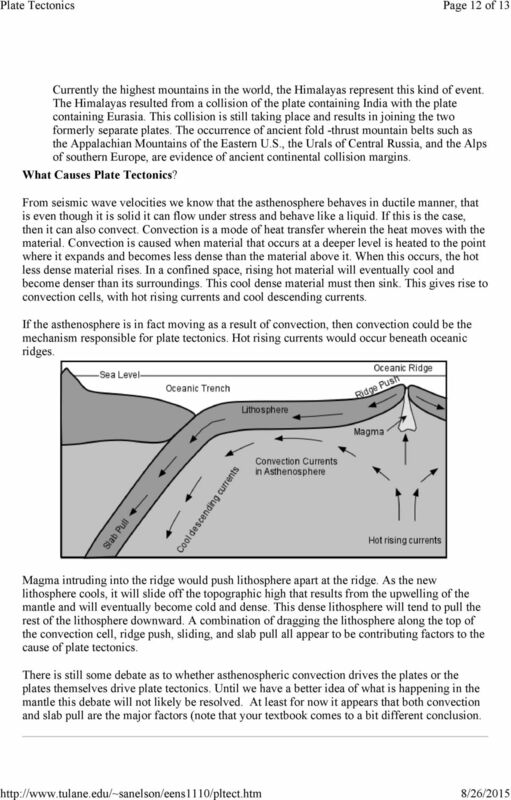 New plate boundaries can form where mantle upwelling results in creating a rift in the crust and plate boundaries can die when when two plates of continental lithosphere collide. Continental Rifting - A new divergent plate boundary can form when continental lithosphere stretches, and thins to form a rift valley. 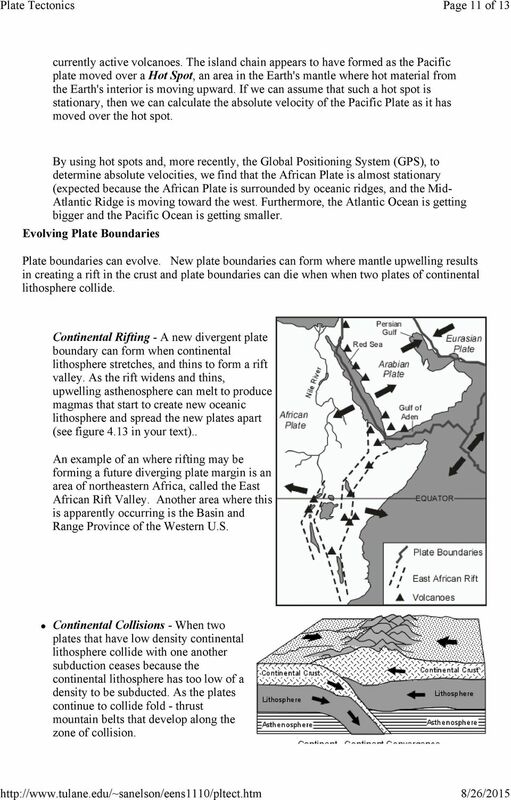 As the rift widens and thins, upwelling asthenosphere can melt to produce magmas that start to create new oceanic lithosphere and spread the new plates apart (see figure 4.13 in your text).. An example of an where rifting may be forming a future diverging plate margin is an area of northeastern Africa, called the East African Rift Valley. 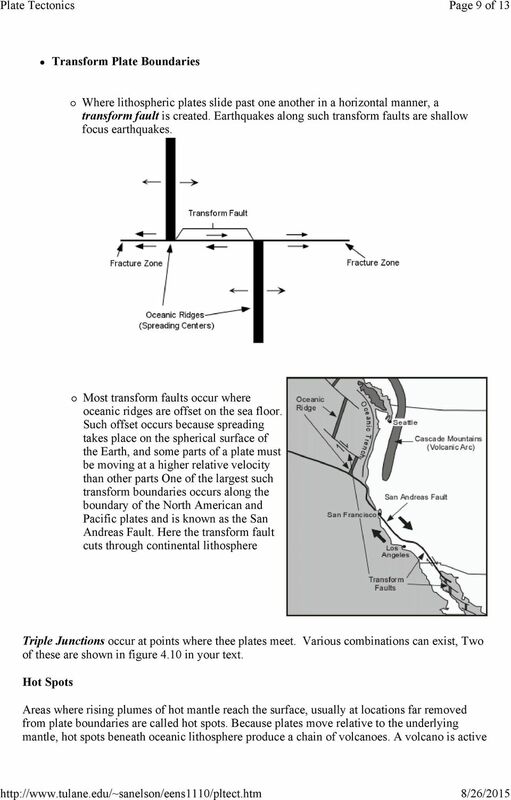 Another area where this is apparently occurring is the Basin and Range Province of the Western U.S. Continental Collisions - When two plates that have low density continental lithosphere collide with one another subduction ceases because the continental lithosphere has too low of a density to be subducted. 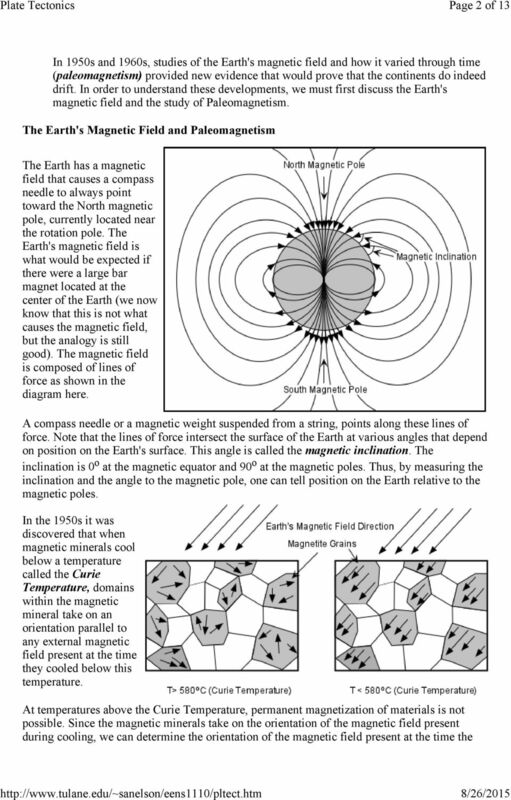 As the plates continue to collide fold - thrust mountain belts that develop along the zone of collision. 12 Page 12 of 13 Currently the highest mountains in the world, the Himalayas represent this kind of event. The Himalayas resulted from a collision of the plate containing India with the plate containing Eurasia. This collision is still taking place and results in joining the two formerly separate plates. The occurrence of ancient fold -thrust mountain belts such as the Appalachian Mountains of the Eastern U.S., the Urals of Central Russia, and the Alps of southern Europe, are evidence of ancient continental collision margins. 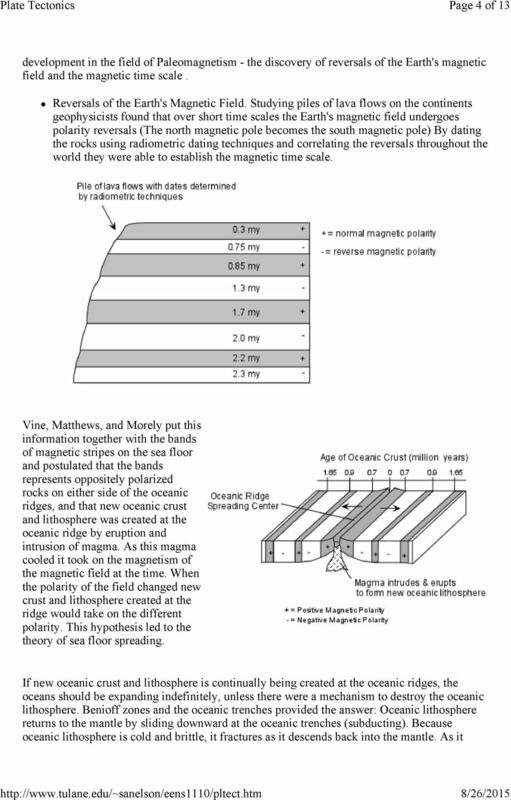 What Causes Plate Tectonics? From seismic wave velocities we know that the asthenosphere behaves in ductile manner, that is even though it is solid it can flow under stress and behave like a liquid. If this is the case, then it can also convect. Convection is a mode of heat transfer wherein the heat moves with the material. Convection is caused when material that occurs at a deeper level is heated to the point where it expands and becomes less dense than the material above it. When this occurs, the hot less dense material rises. In a confined space, rising hot material will eventually cool and become denser than its surroundings. This cool dense material must then sink. This gives rise to convection cells, with hot rising currents and cool descending currents. If the asthenosphere is in fact moving as a result of convection, then convection could be the mechanism responsible for plate tectonics. Hot rising currents would occur beneath oceanic ridges. 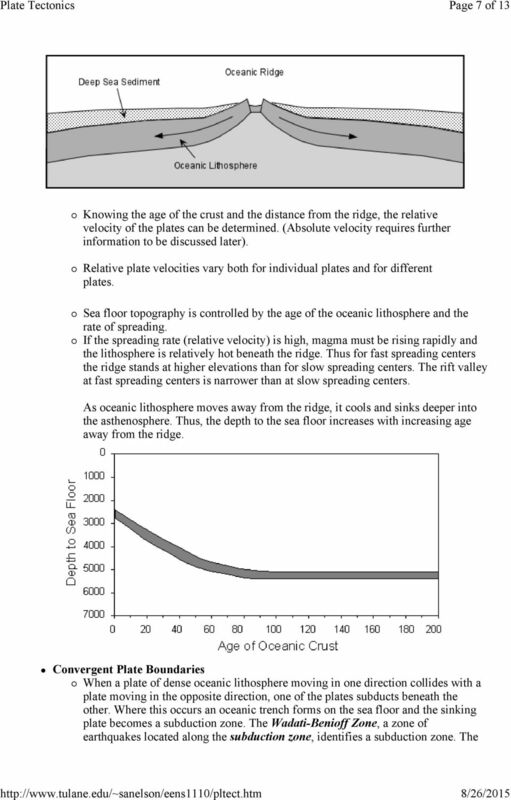 Magma intruding into the ridge would push lithosphere apart at the ridge. As the new lithosphere cools, it will slide off the topographic high that results from the upwelling of the mantle and will eventually become cold and dense. This dense lithosphere will tend to pull the rest of the lithosphere downward. 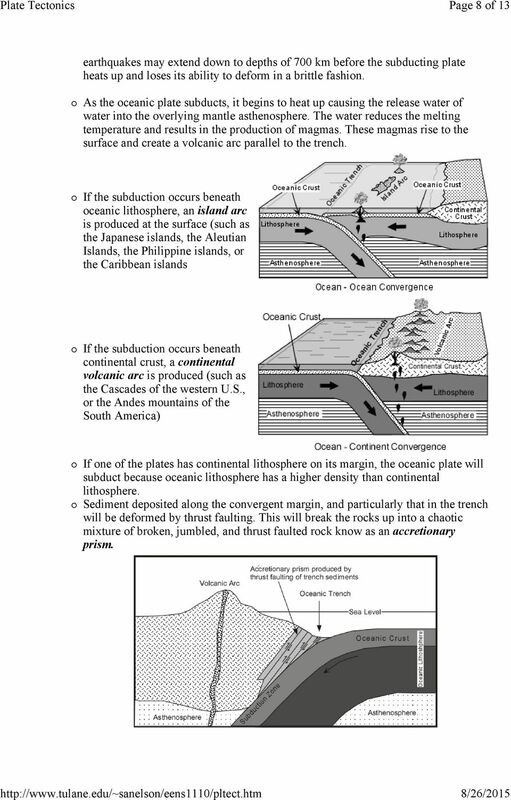 A combination of dragging the lithosphere along the top of the convection cell, ridge push, sliding, and slab pull all appear to be contributing factors to the cause of plate tectonics. There is still some debate as to whether asthenospheric convection drives the plates or the plates themselves drive plate tectonics. Until we have a better idea of what is happening in the mantle this debate will not likely be resolved. At least for now it appears that both convection and slab pull are the major factors (note that your textbook comes to a bit different conclusion.